The last item is particularly important, as the default NAT setup in VirtualBox didn't allow guests to act as servers (and rightfully so!). To run a guest as a server, you had to create a complex network configuration involving TUN/TAP devices, a bridge, etc. It kind of worked (not with wireless though) but who enjoys messing with their network setup? Not me. Let's try it! 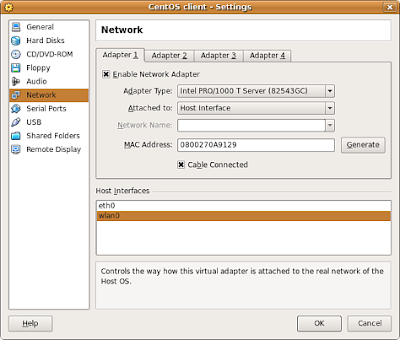 Start VirtualBox, select your favorite guest and edit its network settings: that's Settings, then Network (duh). This brings you to the screen below. If all goes well, the guest will use DHCP to get its network setup from my wireless router. Let's boot it. A few seconds later: grrr, this is not working. Why? Ha ha, it looks like DHCP worked: I've got an IP address (ifconfig eth0), a default route to the gateway (route -a) and up to date DNS information (/etc/resolv.conf). PING gnu.org (199.232.41.10) 56(84) bytes of data. PING 192.168.0.6 (192.168.0.6) 56(84) bytes of data.